Vague stakes and a lack of personal attachment make the long-awaited second season of "American Gods" a lifeless road trip. “Continue” is kind of a dirty verb when it comes to television synopses. If the best description you can muster for what’s about to happen boils down to “more of the same,” then you’re either embracing the episodic nature of your series (“NCIS” can use “continues” as much as it wants), overcautious about spoilers (a la those vague “Mad Men” summaries), or you’re stuck in a passive cycle of inactivity. Option C seems to be the case for “American Gods,” the Starz drama which prefers to continue preparing for war between new and old gods instead of actually commencing battle. Of course, “American Gods” is lucky to be continuing at all. When Season 2 commences, the March 10 premiere will be about six weeks shy of the series’ two year anniversary. That’s a long time to be off the air for any show, but especially an ambitious, opaque, and altogether disappointing freshman drama. Viewers were never intended to wait this long. Following Season 1, showrunners Bryan Fuller and Michael Green left the series due to financial and creative differences with producer FremantleMedia North America. Frequent Fuller collaborator Jesse Alexander stepped in to replace them, but the involvement of original creator Neil Gaiman has been in dispute. (He’s been working on his other TV adaptation over at Amazon, “Good Omens.”) Moreover, famous cast favorites like Gillian Anderson and Kristin Chenoweth (who are close with Fuller) will not be reprising their roles, leaving the impressive cast a little less enticing. So much has changed behind the scenes, all to keep a visually resplendent yet narratively stagnant series very much as it is — well, congratulations, Starz, you nearly pulled it off. The show must go on, for whatever reason, and all Season 2 manages to do in the first few episodes is just that: continue. Sparing any spoilers, the first three episode descriptions sum-up a feeling of perpetual waiting: In the premiere, Mr. Wednesday, aka Odin (Ian McShane), “continues his quest” to unite the Old Gods against the New Gods — just as he did throughout Season 1. In Episode 2, “The Beguiling Man,” Mr. Wednesday “begins preparation for a great battle,” which is just another way of saying he’s still doing what he’s been doing for the past nine episodes. In Episode 3, he “gains [someone’s] help in forging an alliance,” which will be helpful for the upcoming war, but does little to advance the story. There are, of course, other plot lines to keep fans entertained, though none are all that gripping; many are focused on introducing new characters (same as Season 1), and one is a ‘shipping fantasy that would be fun to see play out, yet doesn’t appear to be all that substantial in the long run. Some performances stand out, like Pablo Schreiber’s tough-talking, soft-hearted leprechaun and Emily Browning’s impatient, slowly dying zombie — while others don’t quite elevate above the ordinary. (Try as he might, Ricky Whittle has yet to make Shadow feel human enough to care about.) McShane, meanwhile, seems to delight in the glacial pace of Mr. Wednesday’s plan so much you kind of resent him for being so giddy. A similar reaction stems from the lush visuals and electric production design. 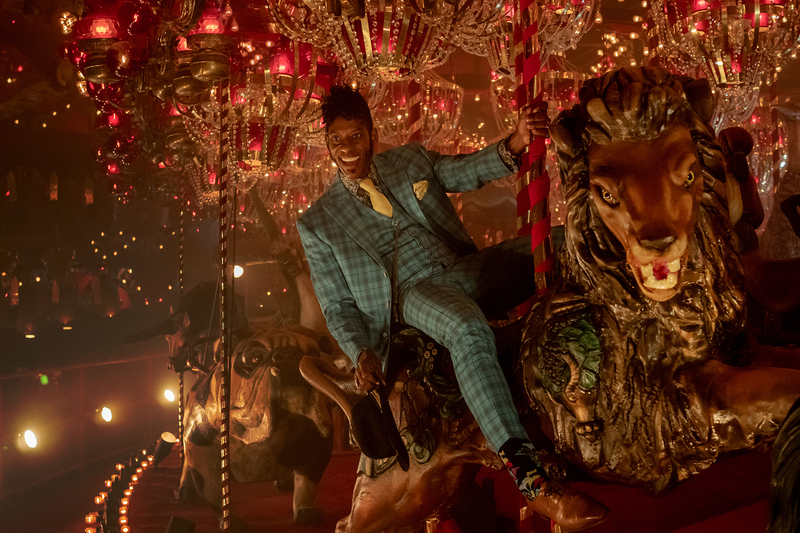 The look of “American Gods” doesn’t quite spring to life as it did in Season 1 — Fuller’s dark sense of humor is hard to replace — and while the creative elegance remains, it’s easy to start resenting the sumptuous look of the show when it feels like the reason nothing is happening. It’s as though Alexander got lost in the beauty of his creation and forgot about the story — which, to be fair, is something that happened in Season 1, as well. “American Gods” began with so much promise. It had a glint in its eye, an admired book at its core, and storytellers brimming with excitement to share their vision. But all that potential petered out by the end of the first season, as even the original outline limped to a less-than-stunning finish. After all the work done to keep the show going — and the very real risk it might not keep going — one would hope for more onscreen urgency. Instead, it just continues on, as if nothing changed and nothing will. “American Gods” Season 2 premieres Sunday, March 10 at 8 p.m. ET on Starz.